I used these while on a holiday at a caravan park that did not have ice cube trays. I found them to be very handy to fill and freeze but I do worry about the wastage from each bag. The ice cubes are also rather small, I prefer bigger blocks. They are a tad on the expensive side too. Using glad ice bags is the only way I make ice. They are super easy to make and keep in the freezer. They don’t absorb any smells from the freezer and I find that they are hygienic as you only use them once. So easy to make ice! We actually have an ice maker machine at home, but I just love how easy these bags are! Quickly fill them up with the no spill spout and chuck them in the freezer, no waste as you just remove the ice blocks and you need and throw back in the freezer! A great idea fir when you need ice in bulk in a hurry. Just fill them up, freeze them and rip off the plastic to remove. 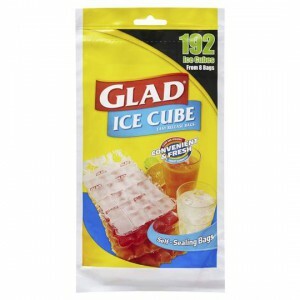 How would you rate Glad Ice Cube Bags?